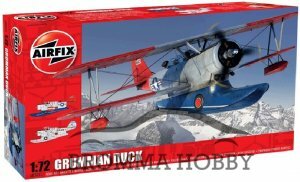 Used by every branch of the United States armed forces from before the Second World War to just after, the J2F Duck proved to be a rugged and dependable utility floatplane. Deployed in a variety of uses from air-sea rescue to anti-submarine patrols, the Duck was to be found from the cold wastes of Alaska to the heart of the South Pacific. Also exported, the Duck found widespread use in South America, where its strength and easy flight characteristics were much appreciated. Produkten lades till Tuesday den 19 June, 2012.